The Place Located in Ion Orchard, Violet Oon should be a familiar name to most people by now, which has its first outlet in Bukit Timah and presence at the National Gallery Singapore. The Peranakan restaurant recently opened its fourth and largest outlet in the heart of Orchard Road at Ion Orchard, which comprise of a retail and confectionary space, along with a dining space which can accommodate up to hundred diners. The restaurant is located at level three of the mall, decked in its signature green, black and gold finishing. This space used to be Marmalade Pantry (which has moved to level 4 where Jumbo Seafood is also located), but I feel that the injection of Violet Oon Ion brings a more interesting dimension and alternative to the mall. The Food The menu for this outlet focuses on Singapore cuisine, instead of being branded as a Peranakan restaurant. I dropped by recently to check out its newly launched breakfast menu, which is available daily from 10am to 11:30am. The menu is quite concise for breakfast, with a good variety of coffee and various tea blends including some exclusive ones. For a start, I had the Roti Violet Avocado Baba (S$17), an avocado “toast” topped with feta, dill, onsen egg and bacon with a hint of paprika. This is served on a fluffy roti prata, which feels like an Indian inspired dish. There is a slight kick of spice on the prata which is quite good. Alternatively, go for the Roti Violet Tuna Wala-Wala (S$15), where the crispy tuna flakes is seasoned with spices, mustard seeds and crispy curry leaf. Another Singaporean’s favourite breakfast dish, the Kaya Toast (S$8) is a huge toast for sure. It is significantly more expensive than what you could typically get, but this huge slice is good for sharing. The texture is thick and slightly crispy, spread with generous slab of good kaya and rich butter slices. I can clearly do with more of it. The Otak Toast with Salad (S$16) is also one dish which works for me. I enjoy Otak, and it is good to taste the fresh fish flavor in this version, prepared with spiced coconut cream fish quenelle. 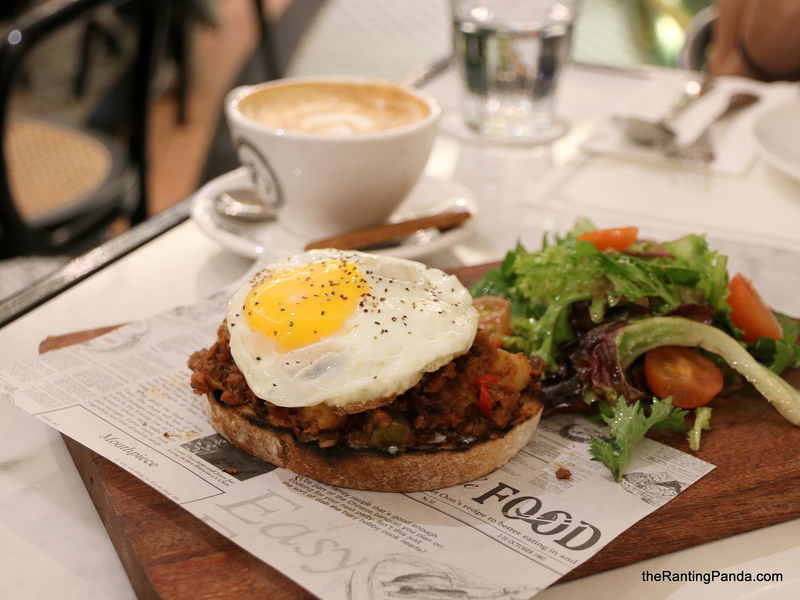 If you are looking for something with a heavier flavour, go for the Corned Beef Hash (S$18). The corned beef is fried with fried potatoes, onions and chillies, topped with a sunny-side up egg on sour dough toast and served along with house salad. This feels more like a brunch dish rather than a breakfast though. For dessert, we had the Pulot Hitam with Caramelized Banana and Mango (S$15). I am not big fan of pulot hitam, but if you are, this portion is big enough to share between three to four persons as it is quite filling. Rants The breakfast menu hour is relatively short, which might make it difficult for people to try especially if they do not work or stay near Orchard Road. Will I Return Again? I wouldn’t mind returning for lunch or dinner to try its regular menu. The prices for breakfast are similar to those most cafes are offering, expect that this is in the heart of town and you can’t go very wrong with the Violet Oon brand.